The definition of meditating is to: think deeply or focus one's mind for a period of time, in silence or with the aid of chanting, for religious or spiritual purposes or as a method of relaxation. It is scientifically proven that people who meditate are known to be happier and healthier then those who don’t. 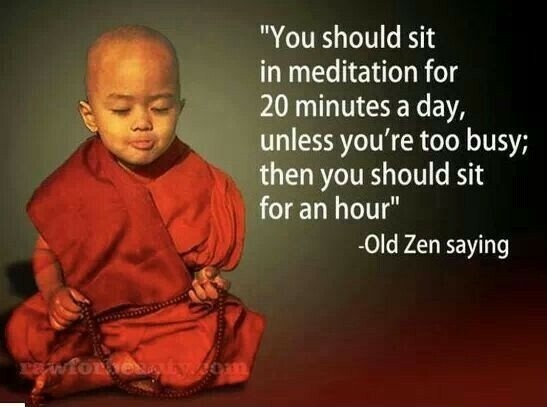 Apparently there are approximately 23 different types of meditation. Who knew? I will not go into every type of meditation I would like to describe the foundation of meditation and the benefits of its practice. According to wikipedia, meditation dates back to 1500 BCE from traditions of ancient India. The earlier forms of meditation were believed to increase focus on a path to salvation, or spiritual enlightenment. While during middle ages, with the growth of certain religions, meditation practices were modified according to the religion, such as certain postures, repetition of phrases or prayer, and breathing techniques were introduced. Modern history brought the West yoga practices, which introduced meditation as a stress reduction, relaxation and self improvement technique. An eight week Harvard study has found that meditation actually changes the grey matter of the hippocamppus. What does that mean? It means improving learning, memory, self awareness, and compassion. Helps with that silent killer, “stress”releasing stress neutralizing brain chemicals. Try to take 5-10 minutes per day to start. Focus your attention on the breath and on how the body moves with each inhalation and exhalation. Notice the movement of your body as you breathe. Observe your chest, shoulders, rib cage, and belly. The main goal of meditation is freeing the mind from things that it cannot control, and gaining a sense of calm and inner harmony.